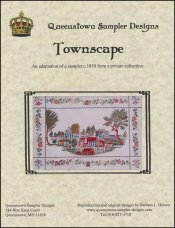 Townscape [H5426] - $28.00 : Yarn Tree, Your wholesale source for cross stitch supplies. Cross stitch pattern by Queenstown Sampler Designs. An adaptation of a c.1850 sampler held in a private collection. Townscape is a bird's eye view of a mid-19th century town. Colorful houses and trees are in the center with a border of Berlin work rose sprays and two flower baskets. Stitch count 269 high x 397 wide.